By Jim Purpura. Posted August 19, 2012, 11:36 AM. Accompanying the thunderstorms of about a week ago, three microbursts (in Sun City, Northeast Temecula and in the Temecula Valley Wine Country) were among wild weather reported in Western Riverside County. Two of these were reported through WeatherCurrents.com, and I investigated damage in Northeast Temecula. Other impacts of the active monsoon over the last few weeks that we've been following at WeatherCurrents, besides thunderstorms, have been flash floods (such as Friday's in Lake Elsinore), debris flows, large hail, funnel clouds, tornadoes (such as August 11th's in Nuevo), and damaging winds. Almost all of the wind damage has been due to downbursts or microbursts. In the three events previously mentioned, this has included primarily roofs, fences, and trees. So what exactly is a downburst? To answer we need to look at the thunderstorms that downbursts are associated with. Thunderstorms all begin with a moist warm bubble of air that accelerates upward. Meteorologists call it an updraft. As the updraft races upward, it expands and cools, and the moist air condenses into clouds and eventually raindrops. As the rain falls, it cools the air around and a downdraft develops. The cool air is heavier than the air around it, and the downdraft falls toward the ground along with the rain. If the downdraft is strong enough to cause wind damage on the ground, it's called a downburst. Very small downbursts are termed "microbursts". Microbursts can cause damage in a small area and happen quickly. I mentioned that I surveyed a damage area in northeast Temecula from last Saturday (August 11th), for WeatherCurrents and for the National Weather Service. The damage was only 20 yards wide and confined to one backyard! The residents of the home where the damage occurred said the strong winds only lasted a few seconds, but managed to blow down the front yard and backyard fences. Sometimes, especially in the west, the most damaging winds occur when the downburst develop just above a layer of dry air. The strong wind then makes its way to the ground, even though the rain has evaporated. Microburst illustration. From the United States Federal Aviation Administration. 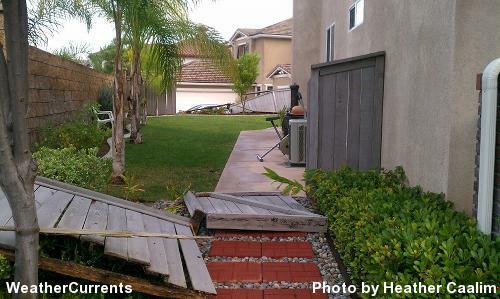 Microburst damage in Northeast Temecula. Photo courtesy of Heather Caalim.